Apply to SDSU via Cal State Apply and receive your RED ID – your official SDSU student ID number. Submit official transcripts and GRE and/or TOEFL test scores. A list of universities/colleges you’ve attended. A statement of your personal interests and professional goals. Recommendation evaluation (optional) – Applicant can provide names and email addresses for recommenders. Recommenders will be invited to complete a recommendation evaluation electronically. SDSU uses the California State University common admission application for both domestic and international students. The application and fee can be completed online through Cal State Apply. If you cannot apply online, you should contact the Graduate Admissions Office to make special arrangements to apply electronically with campus assistance. International students should apply through Cal State Apply. It is important to complete the CSU application as soon as possible in order to be issued your RED ID number. After you submit your electronic application, your RED ID number will be assigned and provided to you. This number will allow you to submit your transcripts and test scores, and track your application status online; it also enables the School of Journalism & Media Studies to monitor your application file. For detailed information regarding SDSU Graduate Admissions, transcripts, test scores, and international students, visit SDSU Graduate Admissions. All applicants should submit official transcripts (in sealed envelopes) to Graduate Admissions from all post-secondary institutions attended. Transcripts are required for ALL institutions, even if only one class was taken. Students who attended SDSU need only submit transcripts for work completed since their last attendance. Students with international coursework must submit both the official transcript and proof of degree. If documents are in a language other than English, they must be accompanied by a certified English translation. **Attention Students with international coursework: You will need to have your school send Graduate Admissions one official original-language record of all academic coursework and proof of degree. For each document, a certified literal English translation must also be provided. The translation may come directly from the school itself or from a professional, certified translator. The translation must contain all information shown on the original-language documents. For details on which documents are required, visit the Requirements by Country page. The GRE or Graduate Record Examinations measure verbal reasoning, quantitative reasoning, critical thinking, and analytical writing skills that have been acquired over a long period of time and that are not related to any specific field of study. The examination is administered by the Educational Testing Service (ETS). The General Test is offered year-round at computer-based test centers in the U.S., Canada, and many other countries. It is offered at paper-based test centers in areas of the world where computer-based testing is not available. Score reports are mailed to you and up to four institutions approximately 10 to 15 days after you take the test. These institutions must be designated on test day. Please allow sufficient time for your scores to be mailed before the application deadline. All applicants must provide official Graduate Record Examination (GRE) scores from the Educational testing Service. 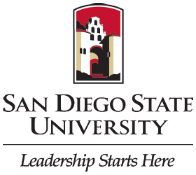 Test takers can designate San Diego State University as a recipient of official scores at the time they sit for the exam by using SDSU institution code 4682 or by contacting ETS directly. If you possess an advanced degree, the GRE requirement may be waived. Please contact the LDT program advisor at ldt@sdsu.edu to learn more. If you do not meet the above minimum requirements, you are strongly encouraged to retake the GRE.